I know I am going through an Ottolenghi stage (and there is more to come) but don’t worry, it won’t last. I go through stages all the time. This is the salad recipe I have been wanting to post for ages. At first I didn’t like the photo, then I thought, “Too much Ottolenghi” and then I thought, “What the hell!” This is a great salad, light and simple: just as a salad should be. I have made it three times in the last month so it must be good. If you don’t have an Ottolenghi book, do yourself a favour and get at least one. My favourite is Ottolenghi The Cookbook but I also like Jerusalem. I am yet to explore Plenty. Plenty More is still on the horizon. This recipe is from Jerusalem. This salad is all about the crunch from the nuts and pita. Whatever you do, don’t add the pita and nut mixture too early, if you do, the bread will go soggy. Leave it to the last minute to add them. The salad will serve 4-6 with a meat accompaniment. Don’t make too much as it will be very limp the next day. Put the vinegar, onion and dates in a small bowl. Add a pinch of salt and mix well. Leave to marinate for, at least, 20 minutes. Meanwhile, heat the butter and 1 tablespoon olive oil in a medium frying pan. Add the pita and cook until the pita is golden, stirring all the time. Add almonds and continue cooking until pita is crunchy and browned and almonds are toasted and fragrant, about 2 minutes more. Remove from heat and mix in the sumac, chili flakes and ¼ teaspoon of salt. Set aside to cool. 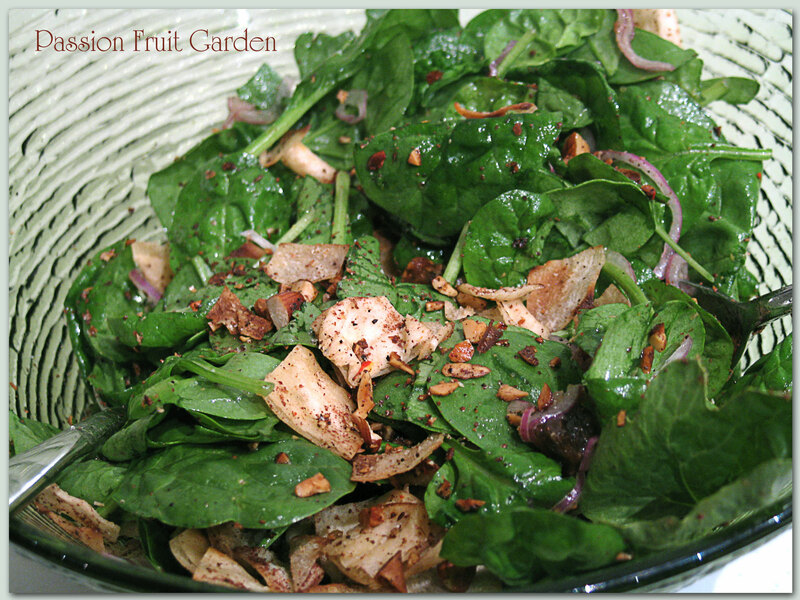 When ready to serve toss in a large salad bowl, the spinach leaves, the dates and red onion mixture, the remaining 1 tablespoon olive oil, the lemon juice and another pinch of salt . 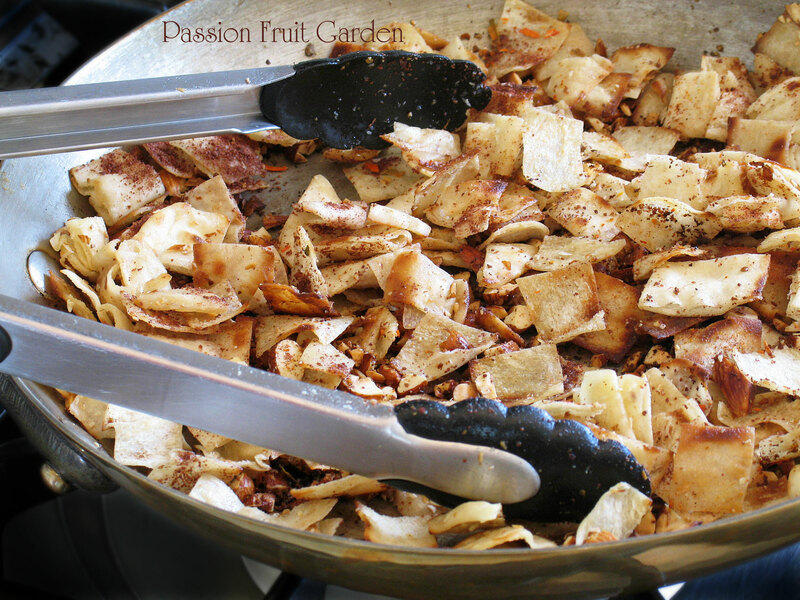 Toss in the pita mix and serve immediately. This entry was posted in Salads, Something Simple, Vegetarian, What's for dinner? and tagged Baby spinach salad, Jerusalem, Ottolenghi, Simple salad by Glenda. Bookmark the permalink. The salad (as well as the photo) look great Glenda. I love a good spinach salad for a change and this one is just so different from anything I’ve ever tried. Love the nuts in there! I just had a great salad at a restaurant recently that had honeyed roasted pistachio nuts in it & now I’ve got to find out how to do that – without making a total sticky mess of things that is. Hi Diane, Honeyed roasted pistachios sure sound good. There are so many salad possibilities I often wonder why we have the same thing most nights. I’m thinking that maybe putting them on parchment paper might? work…at least if it makes a sticky mess I won’t ruin a baking tray. Hi John, I have a feeling it will. You have made this salad look quite delectable. I also have the three Otto L books but am yet to use them. So busy. Try this salad and the roast chicken with saffron, hazelnuts and honey. Both are to die for. Ella that sounds great. Also. I think a traditional Greek Salad has stale bread in it and of course the Lebanese Fattoush does. This looks delicious Glenda. I got a bit frustrated with Ottolenghi last summer so have given him a wide berth since. There’s no denying his ideas are fantastic though! I have had a few duds, but I really like this one. It is a winner for sure. Hi Liz, it sure is, but fun.